Yesterday a pair of common redpolls showed up at the bird feeders at work. I tried to get the camera but was working on a project and couldn't get back to the feeders for 30 minutes or so. They were gone by then and didn't show up today. Today was our volunteer training so I had the chance to take a group of volunteers out on the trails. We found a lot of mouse tracks and trails. 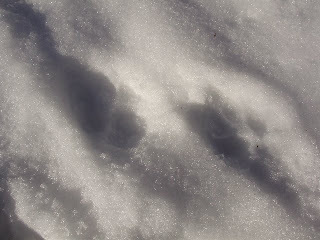 We also came upon some coyote tracks. I tried to take a picture and accidentally shot some video. The video is cool though because it gives you some perspective. On the way home I spotted the Bald Eagles at their nest on Keller for the first time this year. Most of their nest blew down last year so it will be interesting to watch them rebuild it.